We have once again transformed part of our Wholesale VoIP BackOffice. We’ve been working hard on revamping our BackOffice Shopping Cart and it was completed yesterday afternoon. This new Shopping Cart is more organized and offers more control over editing DIDs before one of our customers purchases them. Our newly organized Shopping Cart interface makes it easy for our wholesale VoIP customers to view the details of the DIDs before they actually purchase them. 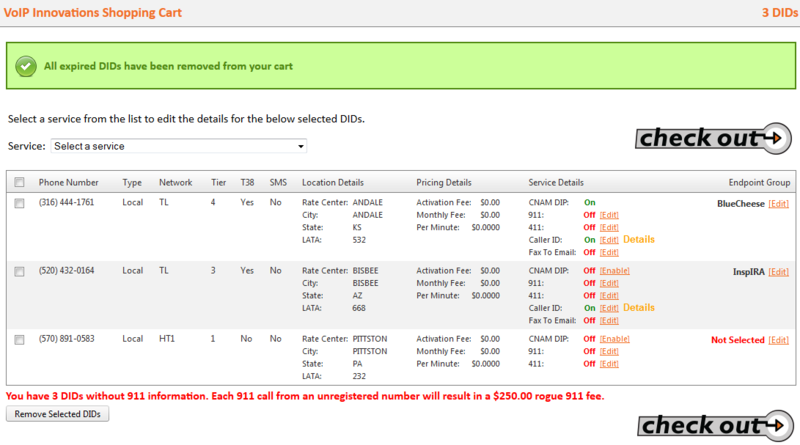 Each DID is listed in the Shopping Cart along with the phone number, network, features, pricing and service details. Before this update was made, customers didn’t have access to any of this information. The second part of our update was a consolidated and streamlined check-out process. After the initial step of selecting a DID to purchase, customers are sent to a new page where they can bulk or individually add E911, 411 (Directory Listing), CNAM (Caller ID), and Fax-to-Email services to the selected DIDs. From this screen, customers can also edit or remove these services in bulk or individually. Our new Shopping Cart will give our customers an experience that is up to par with the rest of our industry leading wholesale VoIP BackOffice. They’ll have advanced DID search features, an improved DID selection process, a streamlined check-out process and the ability to add, edit or remove DID features with the bulk function. Overall, our customers should see a huge improvement in their Shopping Cart functionalities. For questions about the updated VoIP Innovations Shopping Cart, please send an email to us at moreinfo@voipinnovations.com.